It seems to me that around the holidays, parents relax the rules a bit. Whether it’s what time you expect your child to go to sleep, how much leisure activity you allow them or what treats you let them have, or for that matter, how many!! Certainly, the same is true of Chanukah. The kids are out of school, routines have melted a touch, dinners run late into the evening and chocolate gelt is flowing. One of my favorite ways to spend time with my kids was to invite them into the kitchen to help make and shape special cookies for Chanukah. There’s no worry about using knives, about someone accidentally cutting themselves, or about chopping, sautéing or folding. It’s just plain fun. And, as a bonus, kids get to call the cookies their own. I will never forget the special pride I felt as a child, as the nut cake I baked earlier in the day was presented as the finale for a meal, with special accolades for the chef, (me). Decorating cookies allows the creativity in your child to shine through. They can use specially designed cookie cutters to shape the cookies into the shape of Hebrew letters, dreidels, menorahs or the like. Or, they can empower their inner artist and cut unique shapes free hand. Both from an artistic perspective as well as a therapeutic one, what fun. This cookie dough is simple and delicious. It took some time to perfect the texture, I admit. But this has been my go to cookie dough for some time now. In all modesty, these cookies have received rave reviews. For this particular post, I used raw organic sugar, with stupendous results. The cookies actually need no embellishment, they’re terrific on their own. But if budding little artists abound at your home, feel free to decorate. The simplest way of course is to melt some high-quality chocolate and drizzle over the cookies. Or, go to town and arrange different colored sprinkles, an array of colorful icings and a whole lot of palette knives on your counter for your kids to have their pick. 1. Preheat the oven to 350°F. Line two cookie sheets with parchment paper. Set aside. 2. 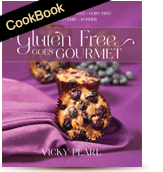 In a bowl, stir together the potato starch, brown rice and sweet rice and tapicoa flours, xanthan gum and salt. Set aside. 3. In the bowl of an electric mixer fitted with the paddle attachment, beat margarine and sugar together for 2 minutes or until somewhat combined. Add the egg and vanilla; mix for 1 minute. 4. Add the dry ingredients, mixing until well blended. If the dough is sticky, flour the baking surface and rolling pin with some sweet rice flour. 5. Divide the dough in half. Roll the dough, one piece at a time, between two pieces of parchment paper until ¼-inch thick. 6. Using Chanukah cookie cutters (or working freehand), cut out desired shapes. Transfer to prepared baking sheets. 7. Bake in the center of the preheated oven for 17 to 18 minutes or until lightly golden. Remove the pans to racks to cool completely. 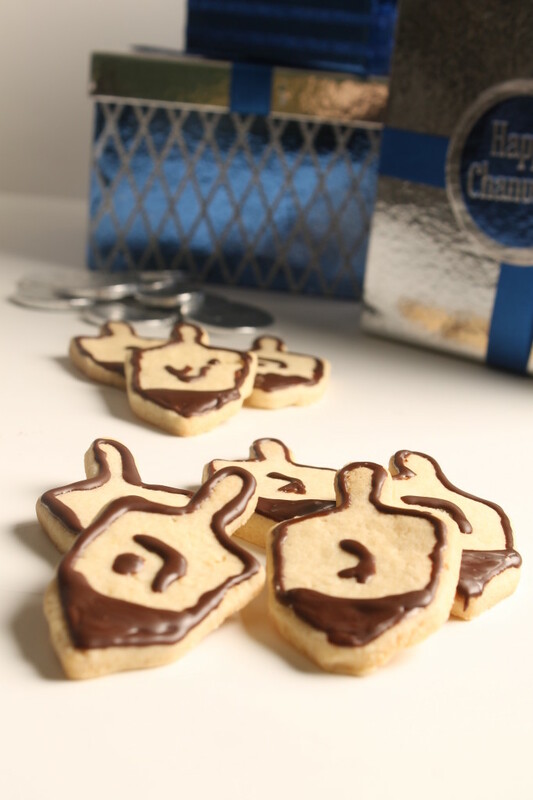 Yield 65 dreidel cookies, 38 menorah shaped cookies.